Here are puzzles about puzzles. 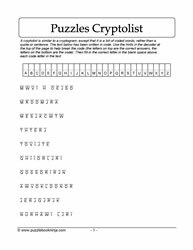 Downloadable wordsearch printables, crosspatch puzzles and scrambled letters game. Matching games, deluxe crossword puzzles, freeform puzzles, cryptolist puzzles, fill-in-the-blank challenges, to engage students' brains and vocabulary building skills are currently under development. Problem solving skills are used as students word to solve the puzzles. Suitable for students in middle grades 6,7,8 and home schooled students. Use differentiated instruction for students in grades 4,5 if needed.